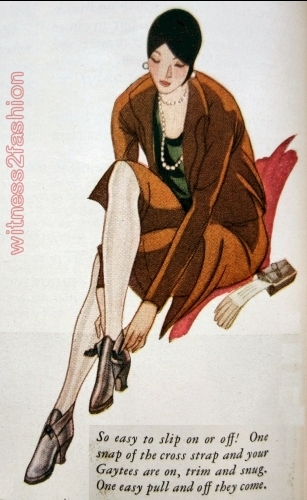 There is a widespread belief that the term “flapper” was first applied to young women in the 1920s because of a fad among college girls for wearing their rubber galoshes unfastened (right). 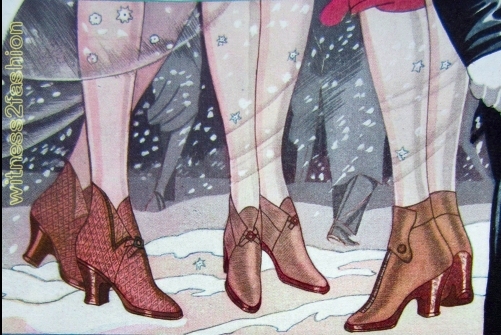 By the late 1920s, two rubber companies were competing for the women’s waterproof boot market, with attractive, tight-fitting fashion boots and shoe covers. Gaytees were made by the United States Rubber Company, and came in a range of styles including waterproofed fabric and even simulated reptile. New styles! Cross straps, turn-down cuffs, a new pointed back style. New colors! The new rosy browns and tans; the tannish grays; black. New Fabrics! Wools, Rayon-and-wool mixtures. All-rubber. New lasts that fit the new Fall shoes! New heels – four different heights. Lighter weight in every pair – yet full protection. The text next to Gaytees worn with a chiffon evening gown (right) says, “Fast color linings. Gaytees won’t rub off on the sheerest evening stockings or the lightest colored evening slippers. And the pointed back adds slimness as well as extra spatter protection…. 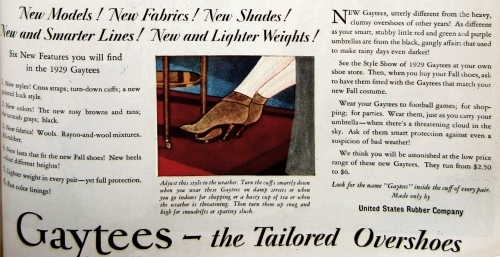 “Your shoeman will be glad to show you the 1929 Gaytees. Let him fit a pair on your slim ankles. 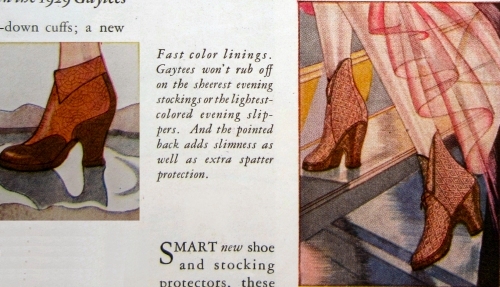 See how snugly they hug the new shoe styles; how well they harmonize with your Winter costumes.” Prices “from $2.50 to $6.” Gaytees usually fastened with snap fasteners, but even when they closed with a ‘slide fastener,’ the ads couldn’t call it a ‘zipper’ because of . . . . 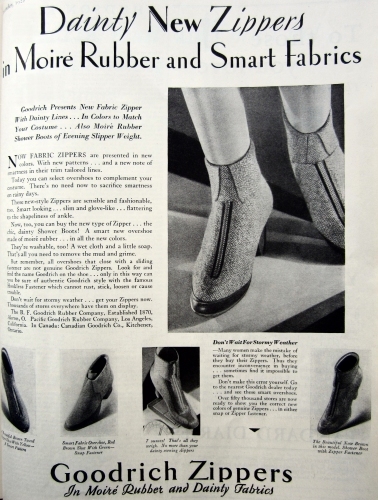 In 1921, the B.F. Goodrich Company had quietly begun experimenting with rubber boots that closed with slide fasteners from the Hookless Fastener Company. 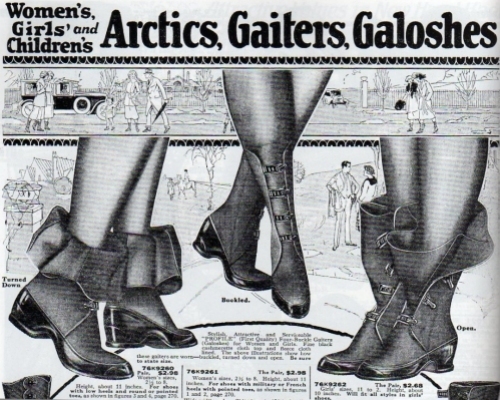 There were problems to overcome, but by 1922 Goodrich had launched their “Mystik Boots,” which closed with Hookless slide fasteners instead of snaps or buckles. They were such an immediate success that B.F. Goodrich Company asked Hookless for exclusive rights to use their fasteners. 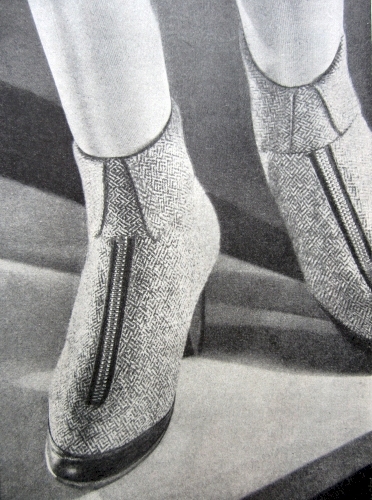 In 1923, the Mystik Boot was renamed, to draw attention to the ease with which they were put on and taken off. Goodrich trademarked the word ‘Zipper.’ At first, “Zipper” referred to a brand of overshoe, not to the gizmo that opened and closed it. 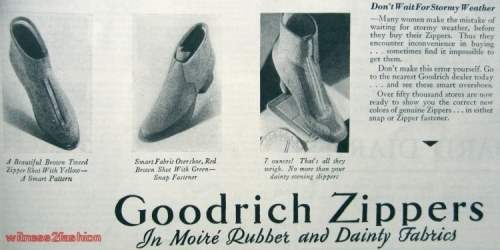 The text at left says, “But remember, all overshoes that close with a sliding fastener are not genuine Goodrich Zippers. Look for and find the name Goodrich on the shoe . . . only in this way can you be sure of authentic Goodrich style with the famous Hookless Fastener which cannot rust, stick, loosen or cause trouble. . . . Over fifty thousand stores are now ready to show you the correct new colors of genuine Zippers. 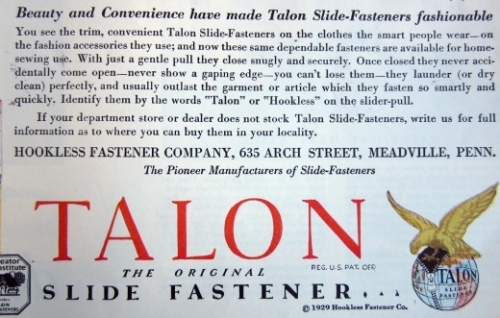 . . in either snap or Zipper fastener.” The Goodrich ad doesn’t mention prices, and it’s not in color. Presumably, Gaytees had to try harder. Fascinating stuff. It’s not often that I come across this kind of information. You might try searching military surplus stores for “galoshes.” I found some, but they were out of stock. Good luck.